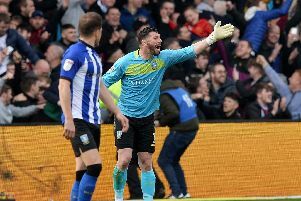 Sheffield Wednesday secured a third straight Championship win after a superb second half performance against relegation-haunted Sunderland. Goals from Lucas Joao, Tom Lees and in-form striker Atdhe Nuhiu ensured the Owls claimed their first victory at Sunderland since 1969. After a turgid first half, Joao fired Wednesday ahead in the 59th minute following good build up play involving Barry Bannan and Nuhiu. Second-from-bottom Sunderland equalised two minutes later, with George Honeyman heading in Lynden Gooch's cross from the right. But Lees put the visitors back in front midway through the half after a great free kick by Joey Pelupessy from the left. Lee Cattermole struck the post for the hosts with a fierce right foot shot from long range before Nuhiu wrapped up the win. The Kosovo international tapped in his fifth goal in his last three matches after Lee Camp had denied Joao. Sunderland: Camp, Love, Oviedo (Matthews 64), O’Shea, Wilson, McNair, Cattermole, Gooch (Asoro 83), Honeyman (Ejaria 83), McGeady, Fletcher. Substitutes: Steele,Lua Lua, Maja, McManaman. Owls: Wildsmith; Venancio, Lees, Fox (Thorniley 8); Hunt, Pelupessy, Bannan (Jones 83), Reach, Boyd; Nuhiu, Joao (Forestieri 90). Substitutes: Dawson, Rhodes, Butterfield, Matias.